Despite a winter we all want to forget, it never ends if you are a pathologist. Everywhere I look there is plant damage due to the extreme winter. Broad-leaved evergreens seemed to take it hard again this year, particularly some of the hybrid hollies. Frozen roots and heavy winds, along with the need to transpire on sunny winter days, left them in shambles. The injury was visible early and often. 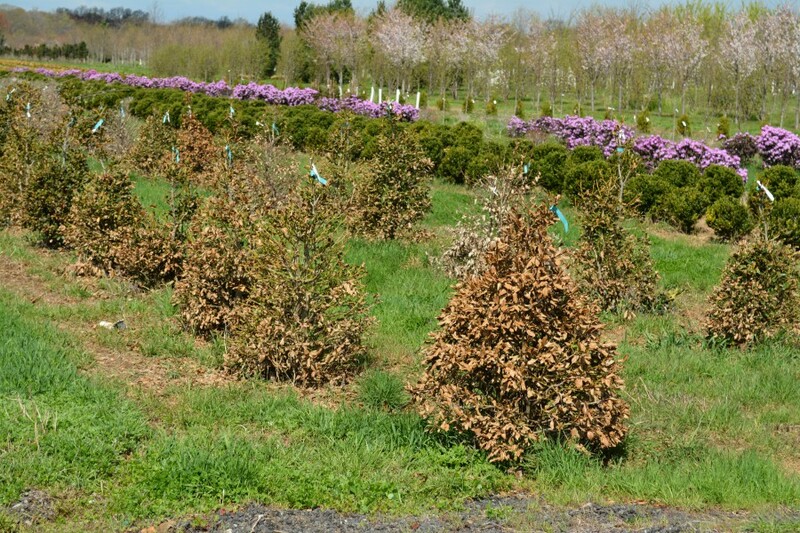 Cherry laurels are one of the usual suspects for winter desiccation and they have not disappointed. 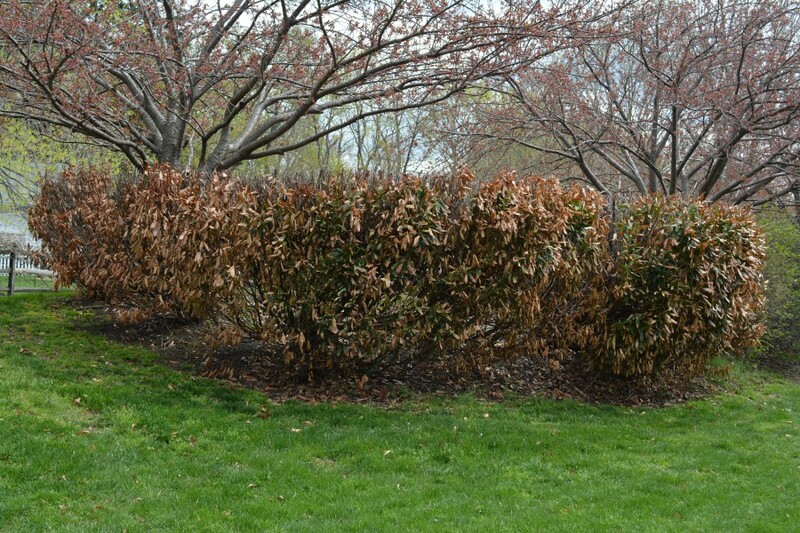 I read in Michael Dirr’s Manual of Woody Landscape Plants that Prunus laurocerasus “is not too successfully used north of Philadelphia,” which makes me wonder why these laurel plantings keep popping up all over New Jersey landscapes. Job security is job security, so I won’t complain. This time last year we devoted a whole blog post to cherry laurel and their odd shot hole-type leaf spots. 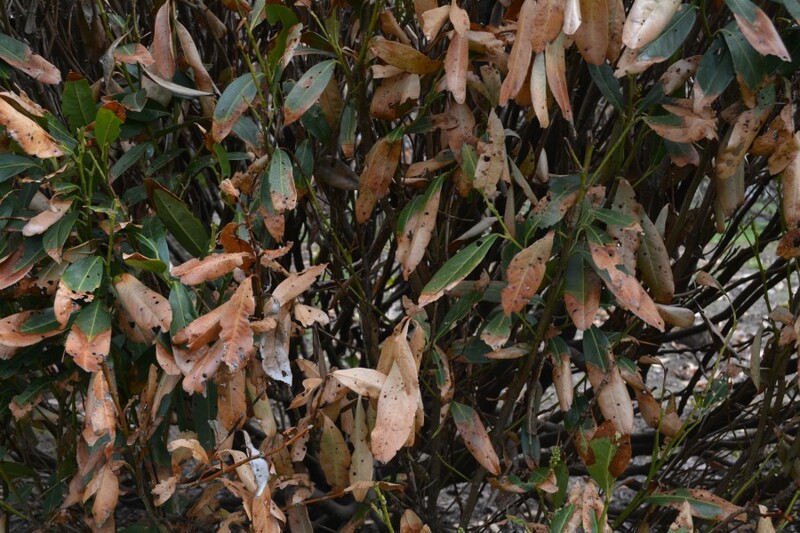 Despite a lot of investigation, the shot holes are just the way this plant expresses winter injury. Damaged tissues coming out of winter drop out and leave a “holey” mess. 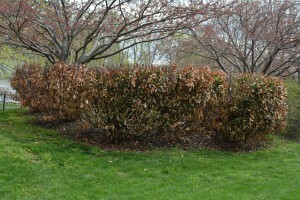 Fortunately, cherry laurel seems to grow like a weed and many outgrow all but the worst damage. 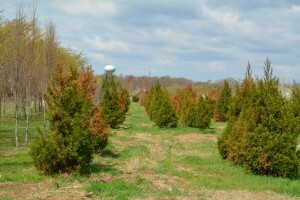 Lastly, we are finally starting to see samples of winter-damaged conifers. Of particular note are the Cryptomeria. A sample came into the Plant Diagnostic Laboratory today and it reminded me of the photos I took last week. I ride my bicycle past the nursery in these photographs almost every day and stopped short when this planting suddenly browned. Delayed onset winter damage (as opposed to the acute damage featured above) is common with conifers. 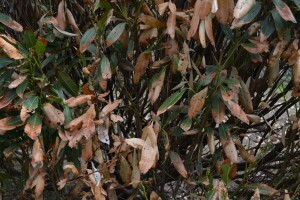 Plants lose winter hardiness in late winter during warmer periods only to have the cambium freeze with subsequent cold. Previously frozen xylem tissues fail as the transpiration demand begins to outstrip the xylem’s ability to move water in the tree. This results in sudden browning of the foliage and/or random dead branches.